We sure know how to name our recipes and this one lives up to its title. 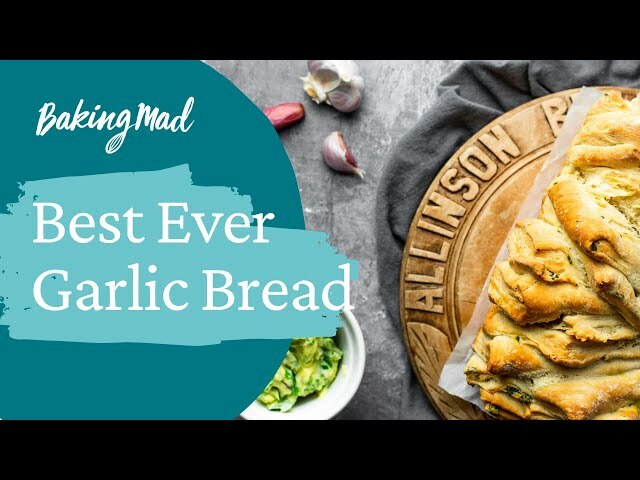 Tried and tested by the whole family, our Best Ever Garlic Bread made with Allinson olive oil dough is a sure-fire favourite for experienced bakers. We find a great alternative for newbies are our moreish Dough Balls also made with Allinson olive oil dough. RISE Lightly grease the mixing bowl with some oil. Put the dough back in, cover the bowl with a clean tea towel and leave to rise until doubled in size – about 1 hour depending on how warm your kitchen is. Mash together the soft butter, Parmesan, crushed garlic and parsley. SHAPE Knock back the dough by gently kneading just 5 times to get the air out. Line the base and ends of a 900g/2lb loaf tin with a strip of parchment. Cut the dough in half, roll each half to a 30cm square then use scissors to cut each square into 9 smaller squares. Spread the garlic butter over the squares, then stack up all the squares like a giant sandwich. Lift the stack into the tin on it’s side to make a stripy loaf. To stop the stack falling over while filling the tin, rest one end of the tin on a rolling pin. PROVE Cover the dough again with a clean tea towel and leave to prove for 10 minutes. Preheat your oven to 180°C (160°C fan, gas mark 4). BAKE Bake for 40-45 minutes, until golden and crisp. Cool in the tin for 30 minutes then enjoy hot or cold.